308 pages | 54 B/W Illus. Generalized Linear Models for Categorical and Continuous Limited Dependent Variables is designed for graduate students and researchers in the behavioral, social, health, and medical sciences. It incorporates examples of truncated counts, censored continuous variables, and doubly bounded continuous variables, such as percentages. 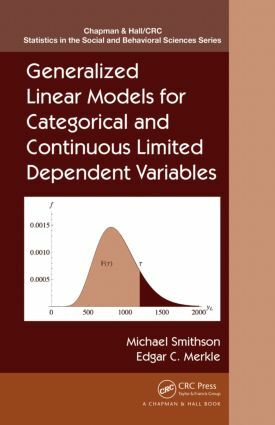 The book provides broad, but unified, coverage, and the authors integrate the concepts and ideas shared across models and types of data, especially regarding conceptual links between discrete and continuous limited dependent variables. The authors argue that these dependent variables are, if anything, more common throughout the human sciences than the kind that suit linear regression. They cover special cases or extensions of models, estimation methods, model diagnostics, and, of course, software. They also discuss bounded continuous variables, boundary-inflated models, and methods for modeling heteroscedasticity. Wherever possible, the authors have illustrated concepts, models, and techniques with real or realistic datasets and demonstrations in R and Stata, and each chapter includes several exercises at the end. The illustrations and exercises help readers build conceptual understanding and fluency in using these techniques. At several points the authors bring together material that has been previously scattered across the literature in journal articles, software package documentation files, and blogs. These features help students learn to choose the appropriate models for their purpose. "… a very useful contribution for anyone who needs modern extensions of statistical modeling tools. I was also impressed with the elegant way in which the authors went about the demanding task of explaining complex methods to readers." "What new perspective or emphasis could be brought to this crowded market? This contribution from Smithson and Merkle is distinctive in several respects. It is geared toward a social-science audience … The authors cover an impressive amount of ground … in one book, the authors cover many different models for a wide array of discrete and limited dependent variables (LDVs). … a valuable resource for graduate students and practitioners in psychology, political science, international relations, anthropology, sociology, education, and communication … . The Beta GLM and some of the models for censored and truncated responses are much newer and more exotic than say, logistic regression or count models, making Smithson and Merkle’s book a welcome addition even for seasoned practitioners … ."